Aston Villa midfielder Jack Grealish must not commit his future to the Republic of Ireland "if his heart's not in it", according to Kevin Kilbane. 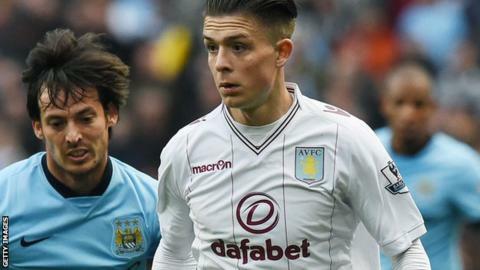 Birmingham-born Grealish, 19, has turned down a place in the Republic squad for next month's friendly against England, for whom he is also eligible. "The only thing I can really say to him is to go with what he wants, what his heart is telling him," said Kilbane. "That's the thing about international football, it must be what you want." Grealish, who has three Irish grandparents, has already represented the Republic's Under-17s, U18s and U21s and had been tipped for a call into Martin O'Neill's senior side after a breakthrough season at Villa. But on Tuesday a "disappointed" Republic manager revealed he had spoken to both Grealish and his father and been told that the player did not want to be considered for the squad for the England game and a Euro 2016 qualifier with Scotland. "Martin O'Neill's had a bit of criticism in some quarters but I don't think he could have done any different really," former international Kilbane told BBC Sport. "He's had to let Jack make the decision himself, he can't pressurise him, and ultimately Jack will go with what he desires. That's the only way it can be. " Had Grealish lined up against England in Dublin on 7 June, he would still have been eligible to represent England as Fifa says caps won in friendlies do not stop a player from switching allegiance. It is a rule the 38-year-old Kilbane, who was born in England to Irish parents and capped 110 times by the Republic, has called into question. "He could have played for Ireland against England in June and still gone on to play for England, which is very wrong," Kilbane said. "That sort of decision can't happen at international level." Kilbane believes Grealish is correct to bide his time over his future. "It's a different situation if a player gets to 27, 28 and they haven't had the call-up they maybe wanted, and they get a chance to play international football for another country," he said. "At Jack's age, he's in a position where he can dictate. I wouldn't want him saying 'I'm going to play for Ireland' if his heart's not in it. "He can make that decision for himself. He's old enough now - he's not a 15 or 16-year-old kid. "Someone might say, 'you can earn more money playing at international level with England', but I would say don't let money motivate his mind." Comparisons have been made between Preston-born Kilbane and Grealish, but the former Sunderland, Everton and Hull player thinks their situations are different. "When I was picked to play for England at youth level, I didn't want to play for the senior England team. It was never on my radar," said Kilbane. "Both my parents are Irish and that's where it's different for Jack. I grew up supporting Ireland as a boy, I was desperate to play for Ireland. "When I got the call up to the Irish side, it was a case of get me on the plane, get me there as quickly as possible."